Northside champion Balmorals defeated Moose Jaw St. Joseph's to win the provincial title. Carstairs, Crossfield, Didsbury, Innisfail, Olds, Red Deer. Northerrn - Courtenay, Nanaimo, Port Alberni. The Saskatoon City League did not operate in 1929. Instead, there were up to four senior amateur teams from the Hub City that played exhibition games at various times over the summer months, usually against one another but also, occasionally, against rural-based Saskatchewan opposition or American touring teams. The spring of 1929 began with two teams, one called the Quakers and the other referred to as the All-Stars, playing head-to-head contests. As the season progressed, the frequency of appearances by these two, particularly the Quakers, began to wane and another pair of intra-city senior amateur aggregations, the Monarchs and General Motors, picked up the slack and kept the diamond at Cairns Field busy. It wasn’t an uncommon occurrence for a single player to wind up in the line-up of more than one team over the course of the summer. The Regina Balmorals won the three-team Northwest League in Regina (the accredited senior league in the Queen City) and defeated the Moose Jaw St. Joseph's squad 3 games to 2 to take the Saskatchewan senior amateur championship and the Leader Cup. For whatever reason, there was no challenge from any team in northern Saskatchewan for the title. What is a Balmoral? 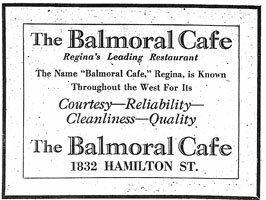 The name came from the team's sponsor, the Balmoral Cafe, Hamilton Street, Regina. (August 31) The first two games of the Leader Cup series ended in a split. Playing in Moose Jaw, the hometown St. Joseph's aggregation edged the Regina Balmorals 5 to 4 in the first game of a double-bill but dropped the second encounter to the Reginans by a 3 to 1 count. Elmer "Lefty" White hit a home run and pitched Moose Jaw to victory in the opener. The homesters had 11 hits off loser Cliff Hogg. Shortstop Johnny Dawson of the Saints led all swatters with a trio of one-baggers and swiped a pair of bases for good measure. In the twilight affair, cut short to six innings because of darkness, Regina's Cliff Hogg stretched his mound work to 13 consecutive innings before giving way to "Wild Bill" Rodgers, who toiled the final two frames. The Bals were never behind in this contest and out-hit their hosts 5 to 2. Outfielder Johnny Stoyand of the Bals was the only player to register two base hits. (September 2) Games three and four of the provincial final were divided in contests played at Regina's Park de Young. The Regina Balmorals jumped into a two games to one series' lead by winning the matinee game of a Labour Day twin-bill, dropping the Mill City crew 9 to 6. Moose Jaw responded with a 4 to 2 triumph in the nightcap, coming from behind to score all four of their runs in the ninth. In the opener, both teams pounded the ball freely, each winding up with 11 base raps, as Regina's Bill Rodgers, with 8 strikeouts, hung on to take the hurling win over L. Mapes of the St. Joseph's nine. A four-run seventh-inning put the Balmorals in front to stay. Shortstop R. Hepburn of the Bals was the game's top hitter, stroking a pair of doubles plus a single. Moose Jaw's Danny McKenna also had three base knocks, one of which went for two bases. Facing elimination in the best-of-five series and trailing in the do-or-die second game of the double-dip, the Saints got to complete game loser Cliff Hogg for a last-at-bat quartet of tallies and lived to breathe another day. Elmer "Lefty" White picked up his second mound win of the series, tossing a five-hitter. Regina catcher E. Van Vliet was the only player on either club to garner two hits. (September 4) In less-than-ideal weather conditions at Park de Young, the Regina Balmorals won the senior amateur baseball championship of Saskatchewan when the took the visiting Moose Jaw St. Joseph's into camp by a convincing score of 7 to 0 in the rubber game of their playoff series. They thus take into their possession the Leader trophy. Del Cottingham pitched for the Reginans and had little trouble in keeping the Mill citizens at bay. "Lefty" White, on the mound for the Saints, was far from the form that had carried him to victory in games one and four, while his teammates failed to make things any better by their weak willow-wielding at the platter.The Bals struck for braces of runs in each of the second, third and fourth frames as the game was essentially over at that point. In early July, the Moose Jaw Times Herald noted a return to the city of one of baseball's great pitchers - John Donaldson. Followers of baseball will be interested to know that none other than John Donaldson will pitch against Moose Jaw All Stars here in the Thursday evening game. Donaldson will be remembered as the dusky gentleman who a few seasons back hurled a no-hit, no-run game against Moose Jaw in the Kiwanis baseball tournament. According to reports, Donaldson has not depreciated a bit, and if Moose Jaw stick artists have not improved with passing years another formidable pitching record is likely. The burly gentleman who receives Mr. Donaldson's fiery offerings is another player of note, and known as the Babe Ruth of the team. According to reports, he cracks them into the tall timber frequently. (July 11) John Donaldson gave up 11 hits as the Colored House of David downed Moose Jaw 11-4. Far from his prime, the left-hander walked two and struck out seven in his route-going performance. At the plate, he had a double and single and scored twice. Catcher Charlie Hancock had three of the visitors' 17 hits. (July 12) The Colored House of David rapped another 17 hits in whipping the Moose Jaw All-Stars 18-7 in the second game of their exhibition series. Young handled the mound chores for the Davids and was the team's hitting star with four hits, including a double and triple, and scored three times. Charlie Hancock had a triple and two singles. Hilton and Jones each had three safeties. John Donaldson, playing the outfield, picked up two hits and scored a pair. Lefty White took the loss.